Photo by Treve Johnson. "Clearing Fog." See Treve's profile on the Artists page. Kathy Goss- Silk Eco Print (dyes from natural materials). See Kathy's profile on the artists page. Deborah Samia is an Oakland sculptor. Deborah's reliefs are contemporary re-imaginings of Norman Rockwell's famous Four Freedoms paintings. Deborah's work is now part of the international tour of “Enduring Ideals: Rockwell, Roosevelt & the Four Freedoms” curated by the Norman Rockwell Museum in Stockbridge, MA. This is the first comprehensive traveling exhibition devoted to Norman Rockwell’s iconic depictions of Franklin Delano Roosevelt’s Four Freedoms: Freedom of Speech, Freedom of Worship, Freedom from Want, and Freedom from Fear. In telling the story of how Rockwell’s works were transformed from a series of paintings into a national movement, the exhibition also demonstrates the power of illustration to communicate ideas and inspire change. Deborah writes, "While exploring the response of an earlier generation to the plea for defense of universal freedoms, the exhibition also resonates with our own time. In my reinterpretation of Norman Rockwell’s four painting, I attempt to bring a cultural diversity that is relevant for our times." “Freedom of Speech- (A Tribute to Norman Rockwell)” 11”x14”x2” Hydrocal Plaster, and Fiberglass Those living in the margins of our society should have their voices heard. In this wall hanging, I’d like to shed a light on female janitors and maids that work at night, after-hours, unseen, unheard, and often victims of assault. “Freedom From Fear- (A Tribute to Norman Rockwell)” 11”x14”x2” Hydrocal Plaster, and Fiberglass With this wall hanging, I re-imagine a contemporary scene that parallels Rockwell’s painting of a family during World War II. A father holds a newspaper with headlines that read: “Bombing Horror” as he tucks his children to sleep…now shown as a Sikh family in fear of hate crimes and possible bomb threats. “Freedom From Want- (A Tribute to Norman Rockwell) 11”x14”x2” Hydrocal Plaster, and Fiberglass The family gathering is a universal and timeless experience for every culture and African American families celebrate their hard earned “freedom from want” with traditional dishes of Collard Greens, Corn Bread, Macaroni & Cheese, Black Eyed Peas and Turkey. 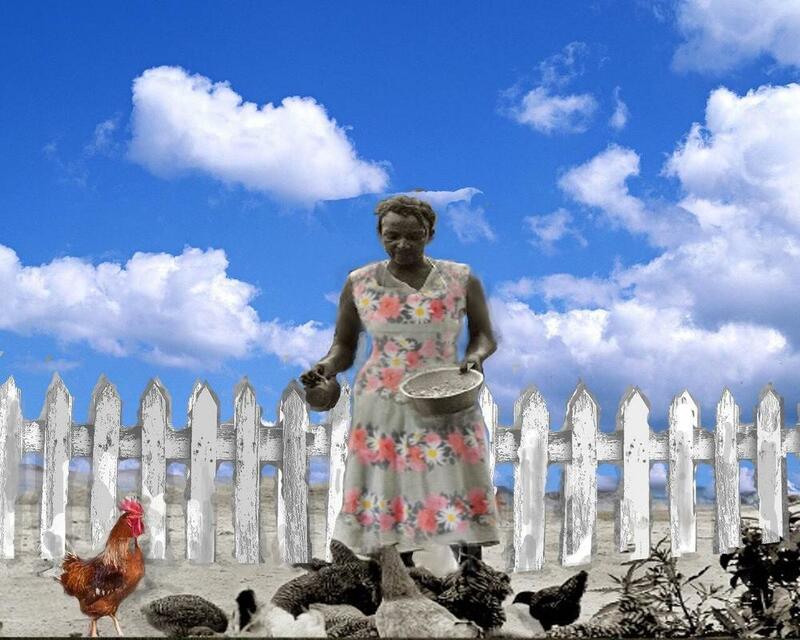 "Feeding the Chickens" Mixed Media by Valerie Brown-Troutt. See Valerie's profile and contact info on the Artists page. "The Wave", oil on canvas by Gray Mercer. Tamalpais Hare, Mixed Media by Jay Flom. Check out Jay's work on Facebook. Last month marked the 75th anniversary of the order to force Americans of Japanese ancestry into internment camps. This photo is at 8th and Franklin, in Oakland, by Dorothea Lange, 1942. Posted by Bennent Hall, Oakland History Group on Facebook. "Frog" -Watercolor by Kathy Goss. Original sold. Giclee prints available. Contact Kathy for details via the artists page.